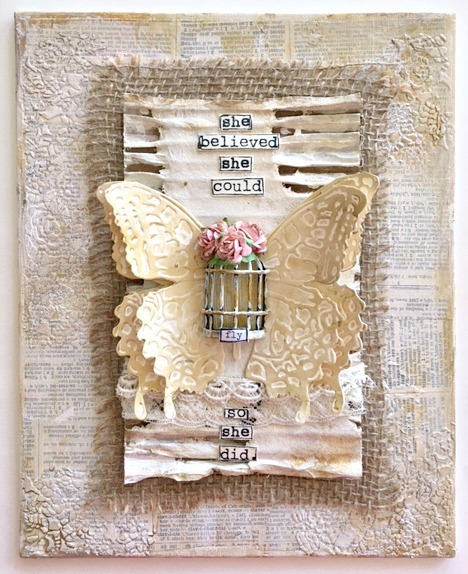 I am here today to share Candy Colwell's theme over on Creative Carte Blanche! I LOVE this theme. As soon as I read it I was giddy...oh, some of my favorite things and to use them all together! What is not to love! I started out by pulling some things out so I had some different thing to choose from. Sometimes I use those things, sometimes I don't. This time the Canvas kind of tool on a life of it's own. I had a dictionary page covered canvas on my desk so I decided to make something with that. Sometimes just looking at what you have laying around can inspire you. I white washed some paint on by putting some on my craft sheet and spritzing water. I just used my finger to apply it...but I always make sure you go in the same direction. I took a piece of Cardboard off of a box that was waiting to go out in the trash...peeled away some of the top layer so you could see the corrugated part. 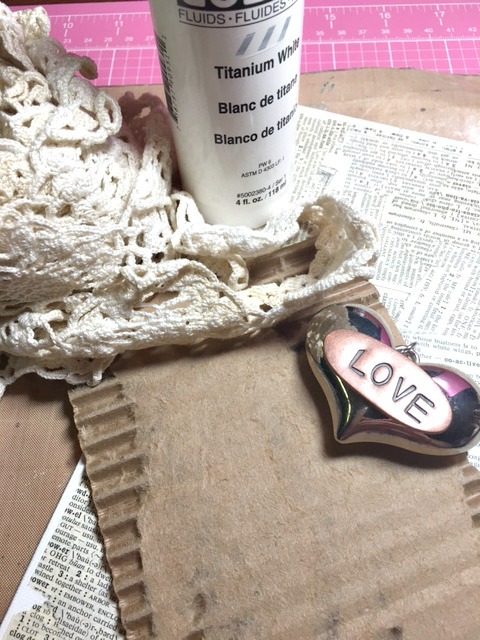 I used the left over paint on my craft sheet and applied it to the cardboard using my trusty ole' fingers...(still the best tool at time, wink). I had some extra butterflies cut and a piece of burlap in the top of my drawer so I added those into the mix. The butterflies are highlighted with some gold paint applied with my finger again. Make sure to thin it a tad...spritz some water to a bit of paint on your craft sheet. It really help highlight the embossing without taking away the neutrality of the cream paper. I also added some texture to the canvas by adding some Texture Paste with a stencil. Highlighted that a bit with left overs of the gold 'wash' on my craft sheet. The bird cage was pewter, but I needed it to be more in line with my color palette. Just added some left over paint that was no my craft sheet...both the the white and gold. Really helped it to become shabby ish and oh so worn and loved, wink. I like the dimension. After all the pieces and parts where ready I just layered it all piece by piece until it became this shabby worn canvas that I have fallen in love with. Note...the bird cage needed something...so I pulled out some little roses to cluster them at the top. 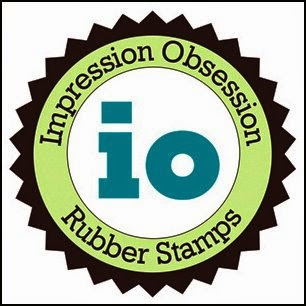 The Sentiment is one of my stamps with Impression Obsession just cut apart. 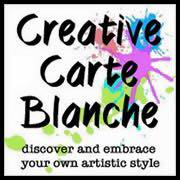 I want to thank you for stopping by and checking my Triple Trouble creation for Creative Carte Blanche. I hope you have found some inspiration today. Make sure to see what all the other girls have been doing this month...there are some fabulous projects! I knew you'd rick this challenge and so you did! You are the Queen of Shabby Chic. 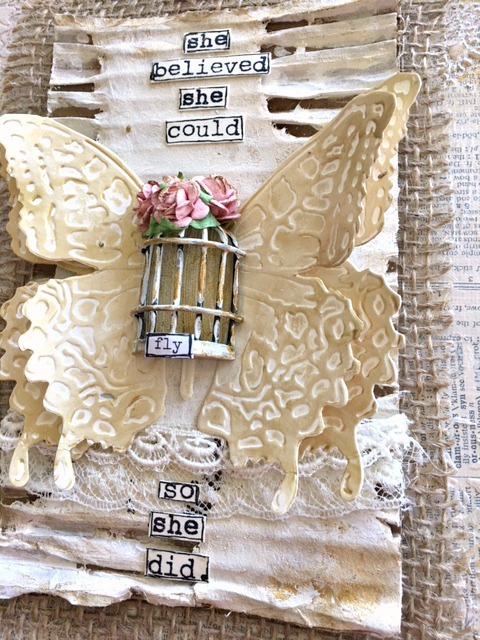 Your corrugated, metal and lace combine nicely with your burlap and butterfly. I love it! Yvonne-where can I find your stamp line? 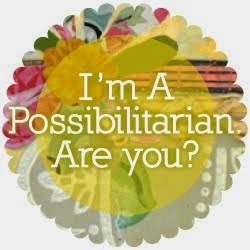 I'm your Titusville connection-maybe a class here one day while you are visiting! Hi Tara, I know you can order them directly from The Funkie Junkie dot com...or you can order the from Impression Obsession. That is IOstamps.com. Thank you for stopping by! I am working on getting some classes going over that way! 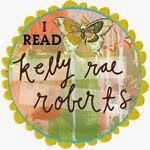 You can sign up for my email on the blog to get updates! Hugs. This is so SO pretty, Yvonne, and so YOU! I adore it. What a lovely addition to your bedroom this will be. Fabulous!!! I LOVE the corrugate and all the layering on it.